The bright clean colors of the monochrome panels shine out from their worldly supports. 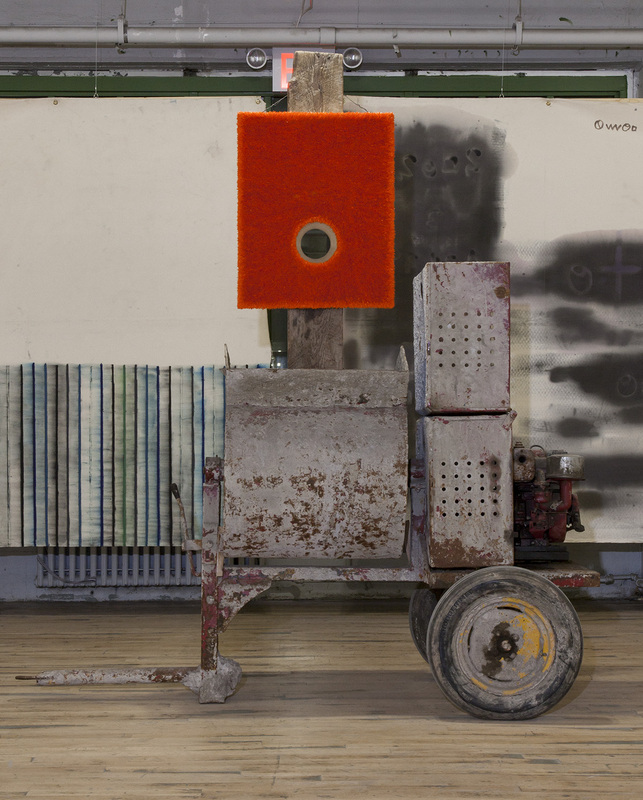 In Lot 080711 (the radiant future) (2011), the support—an industrial cement mixer with a thick board that carries an orange painting—extends vertically out of the open top, while in Lot 020412 (port) 2012, a more-than-half-ton cement block with a board similar to that of “radiant future” bolted to it extends vertically, becoming the direct support for a frosty white painting. Donald Moffett, “Lot 080711 (the radiant future),” 2011. Oil on linen with wood panel support, concrete mixer, driftwood, wire, hardware, 104 x 91 x 45″. Courtesy of the artist and Marianne Boesky Gallery. Photo by Rachel Styer. These particular works not only share the same type of board—one that might be used to block traffic or joist a floor—but also contain perfectly circular holes bored through painting and support alike—a singular and large hole in “radiant future,” and many, small, and sometimes overlapping holes in “port.” The way these voids interrupt the supports by seeming to make them vanish behind the painting counteracts the extreme gravity of the mixer or the block and allows the painting to float. It is the essential element that keeps the whole work standing. The paint itself is applied as a dizzying amount of small, wispy spikes projecting off the surface of the panel and backward over the edges and into the holes. This heavy texture covering the entirety of the painting’s surface, built with extruded paint, is the synthesis of the poetic interplay of the massive and the minute, of heaviness and lightness, of the delicate and the indestructible. The texture of the paint is similar to the villi of intestines, drawing vital nutrients from the environment to feed their hulking form.